Graphs at a glance: ONS stats show 47% of those who graduated in the last 5 years are doing non-graduate jobs. The second biggest destination of new graduates in 2012 was catering, waiters, and bar staff. Office of National Statistics (ONS) figures show a strong correlation between having a degree and being wealthy. However, 'correlation' does not prove 'causation'. i.e. just because two things happen together doesn't prove that they actually cause each other. Daffodils bloom in spring before tulips, but blooming daffodils aren't the reason why tulips bloom. A degree doesn't cause wealth. Those who have the discipline to work hard academically to get a degree are more likely to have the discipline to work hard in their career to get wealthy. The key common factor is having the discipline and the work ethic. When university fees were introduced this correlation was cracked. There was a time when you went to university if you wanted to and you had the grades. That was a time when university education in the UK was not only free, but the government actually GAVE YOU MONEY to go to university. In the 1980s students received means tested grants of up to £2,265 per year. Adjusted for inflation that is worth over £5,000 a year in 2014 money. Sufficient to tide you over term time with just a little parental assistance or a part time job. 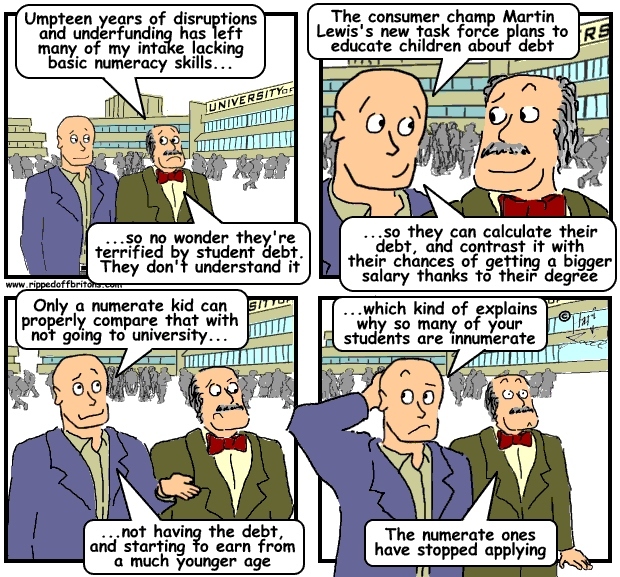 It was the Labour government that introduced money as a significant hurdle to entering university. In the 1990s Labour scrapped the student grant and introduced fees of upto £1,000 a year. Then in 2006 Labour bumped the fees up to £3,000 a year. This opened a gate the Tories happily trotted through, wagging their LibDem tails behind them, putting up fees to £9,000 a year from 2012. ONS statistics suggest this commercialisation of higher education was simply part of a strategy to award more degrees. In 1992 just 17% of the population were graduates (holding a post A Level qualification), while by 2012 this had more than doubled to 38%. Politicians foolishly believed it was the number and not the quality of graduates that mattered. Careless of whether there is a demand for all these extra graduates, and not being able to providing funding for them, politicians simply made the students pay for themselves. From the time fees were introduced those who have the academic ability and desire but are not prepared to carry a large debt have been weeded out of the graduate pool. Student loans are paid back only when the former student reaches a certain salary, which in 2014 was set at £21,000 per annum. The former student then pays 9% of their salary above £21,000. For the government to lose 45p in every £1 of student loans shows that a very large proportion of graduates are not earning enough to have to repay their loans. The UK's Higher Education Careers Services Unit produces statistics for degree holding university graduates. Data for 2012 shows that “retail, catering, waiting and bar staff” was either the first or second most populous destination for new graduates from 19 out of 29 degree subject areas. Jobs from running Tescos to pulling pints require numeracy and literacy, but are unlikely to require deep knowledge of Xerxes nor the mating habits of the nematode worm. (The graph above shows what percentage of graduates from each subject went into retail, catering, waiting and bar staff roles as their first job). Working in a restaurant may of course be a temporary job, with many quickly moving onwards and upwards. 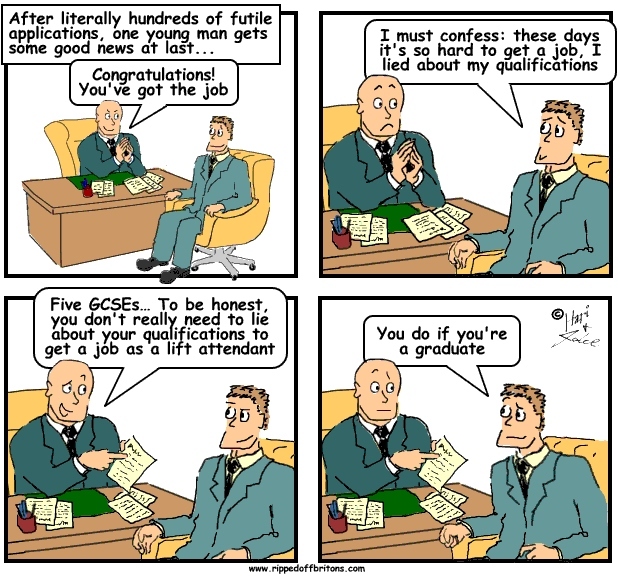 However the Office of National Statistics shows nearly half (47%) of people who graduated (obtained a qualification higher than A Level) in the last 5 years are doing non-graduate jobs. There was a time an employer looking for academic ability could be reasonably sure it would come with a graduate. Since the imposition of high fees this is no longer true, which is bad for both employers and for graduates. 100% accurate - funny if it weren't so sad - joined up government NOT! Spot on. But the UK was only following a whole bunch of other countries in this dodgy strategy (problem: lack of uni funding; 'solution (not)' let's charge everyone and have as many graduates as possible, completely disconnected from actual need, value or quality levels). This strategy has been and will continue to be very poor for the 'customer' of the universities, whether that is the student or society as a whole. And all stripes of Party are guilty of buying into this sh*t.
Sadly this is only one strand of the "tory" rentier consensus of the last 30 years (Conservative, nuLabour and OrangeBook LibDems) that seeks to habituate more and more people to high levels of personal debt to feed their aspirational lifestyles. The politicians benefit personally or through blind trusts by hanging onto or building up assets that benefit from the legislation they pass. That is why the number of Loan Sharks, Money Lenders and Food Banks are a better measure of economic and social "progress" than the number of graduates in the population. "In recent decades the UK’s higher education sector has expanded rapidly, but the increase in the number of graduates has not been matched by an increase in high-skilled jobs. Many graduates are finding themselves working in jobs that would in previous generations have been filled by non-graduates. Comparisons across Europe suggest that graduate over-qualification is a particular problem for the UK, with 58.8% of UK graduates in non-graduate jobs – a percentage only exceeded by Greece and Estonia. "